James Squire and I have had a long history together. When it was still a true micro-brewery near the start of mu drinking life, this was one of Australia's best breweries. A clear shift into mass-production followed, and quality definitely suffered. The brewery has apparently made a resurgence, with new packaging, and hence the Stow Away has found it's way into my fridge. The rise of this brewery from one of the bigger micro breweries to one of the bigger breweries in the country was typified not only by a 50% price rise per carton but also the golden ale being served on QANTAS Australia's national airline carrier. They produce a large number of beers and have some specialty beers brewed only at their brewpubs. I've never had their IPA before, but let's see if the quality has returned. James Squire beers have always poured well and this is no exception. The colour is quite dark for an English IPA, it's actually a very similar colour to the wood of my bar, I'd call it a dark copper colour which is topped by a reasonably sized off-white/beige head. There doesn't appear to be much in the way of carbonation, but that's definitely not a problem in an IPA. It's a solid looking beer. The Stow Away has a simply superb nose to it. This is one of the most complex noses I've smelt on an Australian beer, there is plenty of fruit to digest in this one. I can easily identify apricot, oranges and peaches on the nose and I wouldn't be surprised if there are more. These fruit flavours sit on top of a light yeasty base with lots of caramel malts. Some grassy hops are present, but unlike American IPA's they are not supposed to dominate the nose. This is a simply superb smelling beer! This is a really tasty beer! It's got some serious bitterness about it as well, which I love about it. The Stow Away starts off with a big bitter hop attack, reminiscent of an American IPA, before settling into quite a well rounded beer with some excellent caramel malts. The beer is nice and light in the mouth and has more carbonation than expected, although it is still quite lightly carbonated in the scheme of things. The finish is dry and leaves you wanting more! I take back all the nasty things I have said about James Squire in recent years, this is an excellent IPA and probably the best Australian example of the style I've had! This is a well rounded beer with enough hops to appease most hop heads and has enough sweetness to balance it out for everyone else. This is a really drinkable IPA and I'm going to get some more. 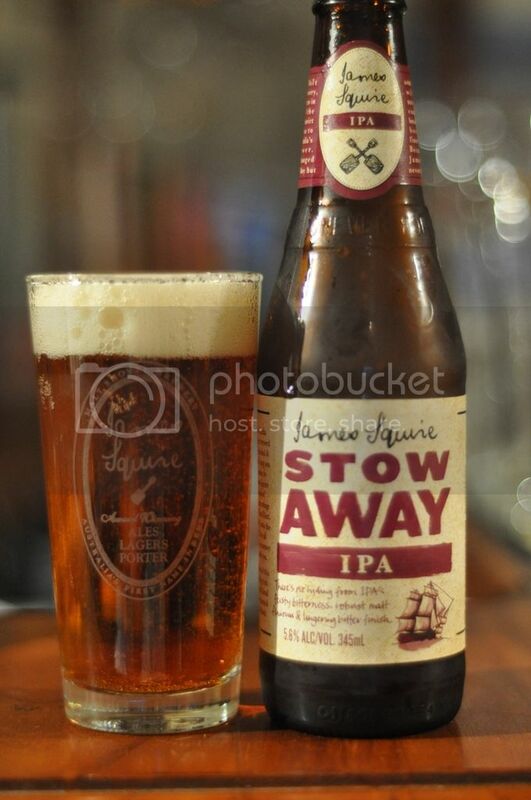 I really hope this is a sign that James Squire is returning to the good old days, as their range of different beer styles and nationwide availability has the potential to really open up the beer world to the average Australian drinker.